Jan. 29, 2019, 1:12 p.m.
By Laura Hazard Owen @laurahazardowen Jan. 29, 2019, 1:12 p.m.
My god, @NewYorker just apply one of those big brains to being able to keep me logged in. I am a New Yorker subscriber and I am logged in and yet the site's paywall is blocking me, which is a very stupid version of Hell. I'm thinking of storing my most secure data in my @NewYorker account, because it is darn near impossible to get or stay logged in even if you know the password. To be fair to The New Yorker, it is not the only site that gets complained about. The Wall Street Journal, The Washington Post, and The New York Times — basically any news site people actually pay to access in significant numbers — also receive their share of complaints from subscribers who can’t stay logged in. But New Yorker login woes are the only ones that have achieved — as NewYorker.com editor Michael Luo put it in a recent interview — meme status. You know, “The ‘New Yorker is terrible’ meme that everyone chimes in on,” he said ruefully. But then, reaching back into the recesses of my brain, I remembered that I had not been a continuous subscriber for 17 years. I let that first print subscription lapse in 2013 when I had a baby and the increasingly large pile of unread issues began sparking serious guilt. I finally re-upped in 2017, when my second child was old enough that I was reading again, but this time I subscribed using a different email address so that I would be recognized as a new customer and be eligible to get, um, a certain bag. My computer’s password manager had remembered my old email address/password combination, but not the newer, current email/password combination. I eventually found that information and successfully logged into my real — real as in current — subscription. Even at that point, though, The New Yorker’s site experienced a delay before recognizing that I was a logged-in, paying subscriber. The first story that I clicked on hit me with a paywall. Then, as if seeming to shift slowly into gear, the site sort of visibly shuddered, refreshed, and let me read the story. All of the “please subscribe” messaging on the site, however, remained. Confident that the problem at least was not only me, I was ready to talk with Luo. Luo also suggested one other thing that might be fueling some of the Twitter complaints. 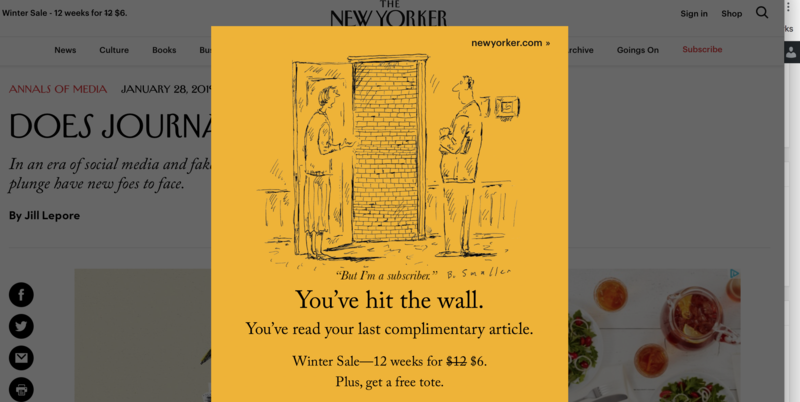 In recent months, The New Yorker has tightened the paywall. Previously, non-subscribers could access six free articles per month on the website; now, it’s four. The New Yorker Today app used to let you access 10 articles for free; that’s now also down to four. It’s possible that many paying subscribers assumed they were logged in, when they actually were not logged in and were just hitting the paywall sooner than they used to. And a handful had probably never renewed their subscriptions at all, and only remembered that when the paywall popped up. Finally, The New Yorker is both saddled with/blessed by its relationship with Condé Nast’s web infrastructure. During my call with Luo, I had the experience — similar to the simultaneously satisfying and alarming feeling of going to the doctor for a weird rash and hearing the doctor say “Well that’s weird” — of introducing him to a subscription page on The New Yorker’s site that he said he had never seen before. “I don’t exactly know how this thing works,” he said. Okay, so the customer care page was a foreign corner that we wouldn’t talk about. But why was it so hard, on NewYorker.com, to tell whether I was actually logged in or not? Why did I keep seeing invitations to subscribe when I already was a subscriber? It wasn’t that this was — any of this — was really such an urgent problem. (My casual testing suggested that it was greatly affected by which browser I was using and whether I had adblocking extensions turned on.) It was just these little things that, well, were noticeable, and annoying. The New Yorker will soon charge $149 a year for a print-plus-digital subscription, up from $120. An annual digital-only subscription is currently $90. I pay $132/year for Netflix, $119/year for Amazon Prime. I rarely if ever have to log into my Netflix or Amazon accounts, which multiple people in my household access across different devices. They’re just there. On the one hand, maybe it’s unfair to have tech-company-level expectations for a single magazine, which is not a middleman in the same way that Netflix and Amazon at least once were (but, as they release more and more of their own programming, are increasingly not). On the other hand, when you’re paying roughly the same price for the products, how can you not compare them at some point? There will have to be a point when the digital media site isn’t always coming up short, when the digital media experience isn’t always worse. We may not quite have reached that point yet, but as publications increasingly look to their readers to support them, we are going to hit it soon. Customer service concerns will become less media Twitter niche complaints — and more inextricably linked with the product itself. This piece was updated to note that The New Yorker did not change its social media policy. Rather, Google ended its First Click Free policy, and now Google users can see four free New Yorker articles per month via Google links. POSTED Jan. 29, 2019, 1:12 p.m.
Owen, Laura Hazard. "Why won’t The New Yorker keep you logged in? Mystery: Solved (kind of)." Nieman Journalism Lab. Nieman Foundation for Journalism at Harvard, 29 Jan. 2019. Web. 20 Apr. 2019. Owen, Laura Hazard. "Why won’t The New Yorker keep you logged in? Mystery: Solved (kind of)." Nieman Journalism Lab. Last modified January 29, 2019. Accessed April 20, 2019. https://www.niemanlab.org/2019/01/why-wont-the-new-yorker-keep-you-logged-in-mystery-solved-kind-of/.